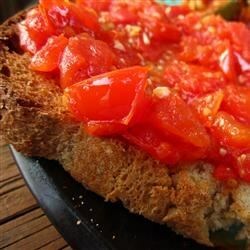 "This bread goes great with any Italian or Mediterranean meal. I've also cut the bread into smaller pieces and served it as an appetizer." In a saucepan over medium heat, stir together tomatoes, garlic, salt, lemon zest, and brown sugar. Cook, stirring constantly, until tomatoes release their juices, about 5 minutes. Reduce heat to low. Cut each half of ciabatta into 2 or 3 pieces. Place cut-side up on a baking sheet, and bake in preheated oven until golden brown. Meanwhile, stir lemon juice, olive oil, and pepper into the tomato mixture. Cook, uncovered, over medium heat until mixture is thick, about 6 to 8 minutes. Remove from heat, and spread tomato sauce over sliced bread. Serve hot. I liked the slightly sweet, very zippy taste of this! Yum! If you like your bread a little softer then bricks barely toast the ciabatta, but the garlic tomatoe dressing is increadible! My kids loved this bread. We did cook it on slices of wheat bread instead of ciabatta, though. Next Time I try it, I'll add cheese on the top!! !